There are days I need a little extra energy boost and as much as I love my coffee a good healthy nutrition packed smoothie is what I really need. Now that it’s warmer I’m back to making smoothies at least once a day and lately with having some afternoon barre classes, S’s crazy soccer schedule, and A’s gymnastics twice a day. 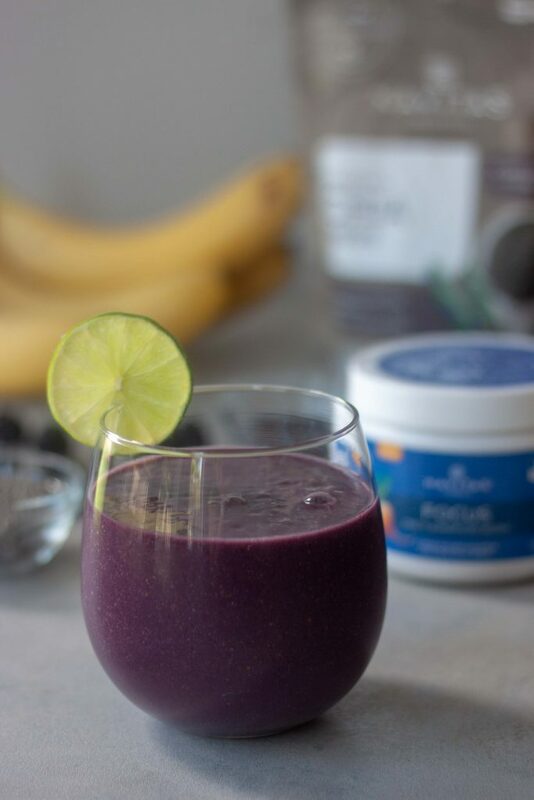 This Make a Move Purple Power Smoothie has been a go to! Along with my Iced Nana drinks, matcha smoothies, pitaya blends, and smoothie bowls. Not to mention I’m getting in all the smoothies I can before we head to Colorado and I need all the energy to get through these last days of school and get everything packed up and ready to go before tomorrow. I’m sure I’ll be craving some good green smoothies when we get back. We’ve been drinking so many pretty pitaya pink smoothies, like my Pink Power Vitality Smoothie, that I was starting to think we might turn pink! So I decided to switch things up and go purple swapping pitaya for berries and maqui powder. 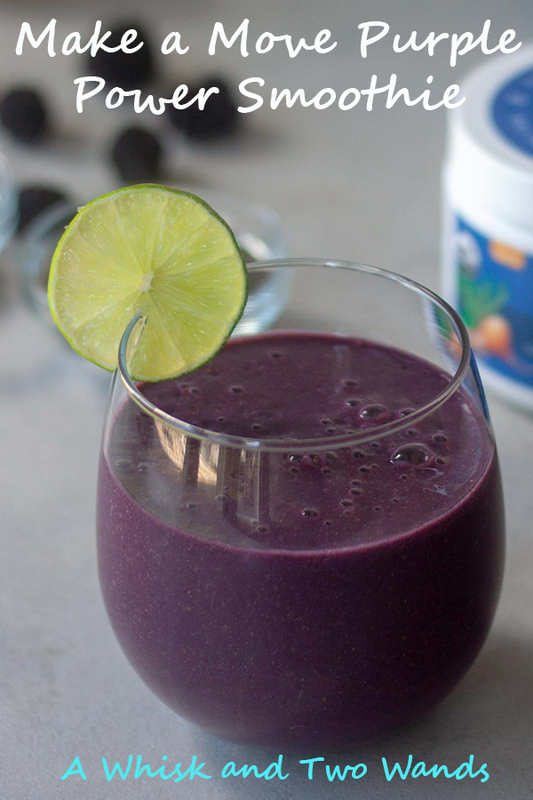 Acai can also be used and this is another one that can be tweaked based on what you have on hand and what you like, like most of my smoothies. 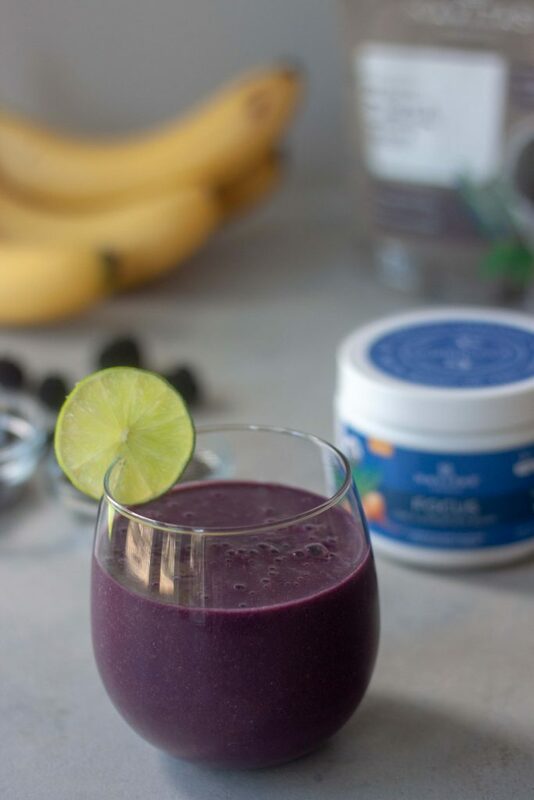 A few basic ingredients with a little superfood punch makes this an energizing blend that isn’t too heavy and won’t weigh you down. Perfect for a little afternoon, or any time, boost. If you want something a little bigger you can add more fruit and or chia seeds and blend into a refreshing creamy smoothie bowl! Breaking down the basics blended in this pretty purple powerful glass. Coconut water or maple water, both are hydrating and packed with electrolytes. Blackberries, or sub blueberries or acai. All three are full of antioxidants, vitamins, and minerals. Half a frozen banana or sub frozen pineapple or mango as we love all three combinations. All three fruits have more vitamins, minerals, and whole food nutrition. I’m not a huge banana fan, unless we’re talking my favorite caramelized bananas, but I really like them pre-workout. Bananas are one of the top pre-workout foods and for good reason. They’re loaded with simple carbs (fuel) and potassium which helps with muscle function before your workout. They also make this smoothie creamy. I don’t like adding a lot of banana to smoothies but in this one it works and gives me the energy I need. Mangos are naturally sweet and packed with vitamins and minerals but I’ve heard many times they are actually low on the glycemic index. They are always in our house as they are S’s favorite fruit. Maqui (powder) is a deep purple berry is one of the most antioxidant-rich foods on the planet. Packed with vitamins (like Vitamin C), minerals (calcium, iron and potassium), and a great source of polyphenols. You need to make sure that you get all your right vitamins and minerals. Did you realise that if you don’t like this smoothie you could get oral iron supplements instead, or any other kind of supplement? I obviously like my smoothies but if you don’t then there are alternatives. However, you must be made aware that if you cannot take iron supplements then you could look at getting it injected directly into your blood stream. This, however, does have some concerns which you can find out more about on a website like this one: www.ironinjectionlawsuits.com. Navitas Organics (my trusted source for superfoods) has benefits listed for Activity, Immune, Stress Reduction, and Longevity. 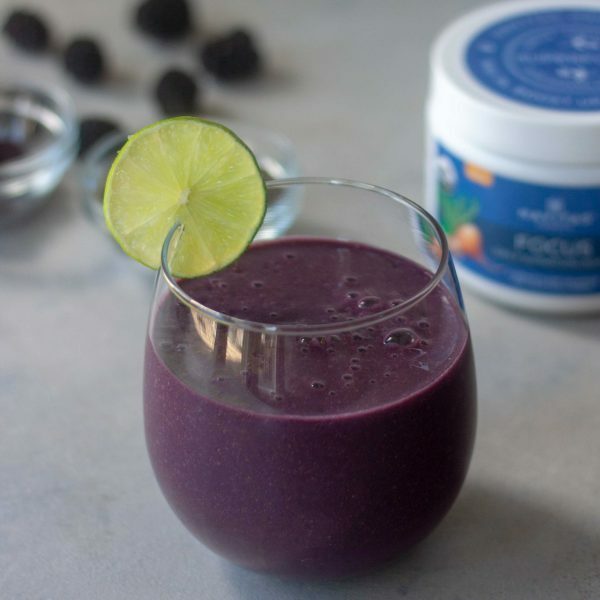 I have a few recipes on the blog with maqui but until earlier this year hadn’t recently bought it as I haven’t had the need and it’s in my Navitas Organics Daily Boost Beauty Blend and Daily Focus Blend. I bought another bag to try to get that perfect purple color in my Blueberry Bliss Bites I made earlier this year. I didn’t end up going with it but it means I have a lot to play with, which pretty much has meant adding into smoothies or bites and adding to coconut butter cups. Navitas Organics Daily Superfood Focus Boost is optional but I LOVE it as it has so many of my favorite superfoods in 1 container! Favorites like maca, matcha, yerba mate, mushroom blend (including reishi) and ashwagandha! The list goes on with acai, mauqi, lucuma, ect. Just what I need early in the morning to get me to barre or in the afternoon for a little boost. Need a little motivation? 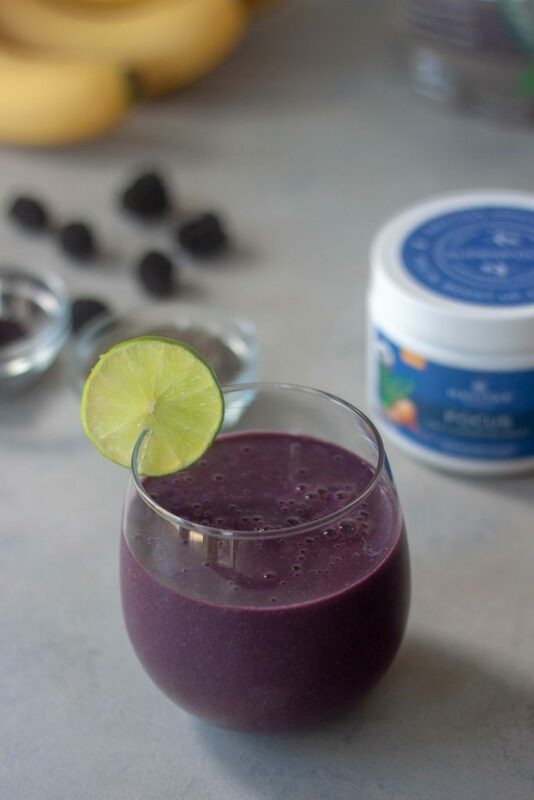 Make a Move Purple Power Smoothie will get you moving and grooving! 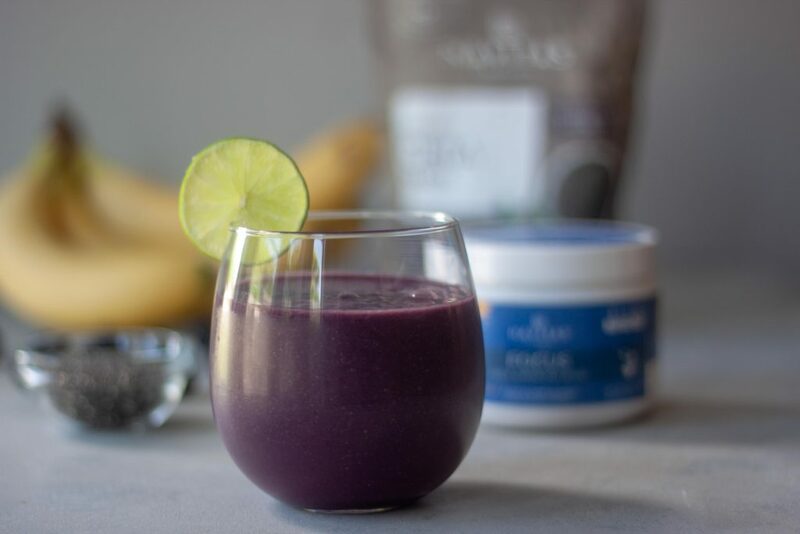 A simple and delicious whole food packed smoothie with optional superfoods and adaptgens that will give you the energy to get moving and groving! In a Vitamix, or high-speed blender, blend everything together until smooth. Adding ice if desired. For a smoothie bowl use frozen berries and add in extra frozen and or berries to reach desired consistency. To make into a smoothie bowl use frozen berries and add more frozen berries or fruit if needed to reach desired thickness. I can almost taste this…yum! This looks delicious! Have you tried it with matcha before?